I am in no way a hip-hop expert. Therefore, I cannot say how good or bad Straight Outta Compton is in regards to the accuracy of the N.W.A. story or their impact on music in general. I can say thought that Straight Outta Compton is a fine film, in equal parts the telling of the rise of the Rock & Roll Hall of Fame inductees and the story of how friends became enemies and full circle. Growing up in the tough streets of Compton, our five young men all had various talents and abilities. O'Shea Jackson, better known as Ice Cube (O'Shea Jackson, Jr.) is the poet, a master lyricist who expresses the world he sees. Andre Young (Corey Hawkins), who is better known as Dr. Dre, is the genius producer, who loves the beats and can bring about any melody into shape. Eric Wright is the money man with the nom de guerre of Eazy-E (Jason Mitchell), the money coming from less than honorable sources. Dre and Cube know Eazy-E can finance them, but they also know he has skills on the rap mike too (even if the voice at times seems a bit high). Soon, with DJ Yella and MC Ren, the group N.W.A. comes to life (for those NOT in the know, N.W.A. stands for N*****s With Attitude). They rap about what they see, what their world is like, and it's not a pretty picture. Still, their style becomes highly popular, so much so that producer Jerry Heller (Paul Giamatti) offers to produce them. This is not an easy alliance, as Heller is white and N.W.A. is black, which means Heller isn't harassed by the police but the rap group is. As a result of another ugly incident where the LAPD goes overboard, the song F*** the Police is recorded and released. Police groups and the FBI are outraged by this, but the band (and its fans) find catharsis in its call of fury. Soon, things start going wrong. Heller and Eazy-E are forming an odd alliance and Ice Cube is not getting the respect or financial rewards he knows he is entitled to. In fact, Heller wants him to apparently take less money (especially compared to Eazy). Cube finds this whole 'Godfather' business unpleasant and decides to go solo. This in turn infuriates the double-act of Eazy and Heller (who holds some sort of Svengali-like power over Eazy). Soon, they both take to the mikes to trash each other. Dre also grows suspicious about Heller, but Eazy won't quit him...so Dre goes his own way and forms Death Row Records, with the obviously above-board Suge Knight (R. Marcus Taylor). Dre, for his part, finds Suge a bit too hard for his tastes (especially after Suge goes after Eazy). The divisions between the N.W.A. members soon start to dissolve after the Rodney King riots (where F*** the Police receives a revival and Bloods & Crypts form a unity pact against their mutual enemy...the LAPD). Things also improve for Eazy when he finally fires Heller after discovering his duplicity, realizing his bandmates were true. As things start coming together for the various members both individually (Dre becomes THE producer of producers and mentor to such figures as Snoop Dogg and Tupac), Eazy-E takes a turn for the worse physically. Eazy-E is shocked to discover he has AIDS. Sorry, E, AIDS isn't just for gays. Eazy-E's death brings N.W.A. to an end, but for Cube and Dre, things are only beginning. Dre has gone on to mentor not just Snoop and Tupac, but such figures as Eminem, while Cube has carved a successful acting career. Who knew that the guy behind those Are We There Yet? movies was once considered a hard-core gangsta? Oh, and for DJ Yella and MC Ren, well, they were just there. I think that's perhaps one of Straight Outta Compton's flaws. The story is so focused around the stories and personalities of Cube, Eazy, and Dre that the other two members of N.W.A. are pretty much there for decorative purposes. Not that the struggles between the trio does not make for good drama (it certainly does), but one wonders what Yella and Ren were doing while all this was going on. 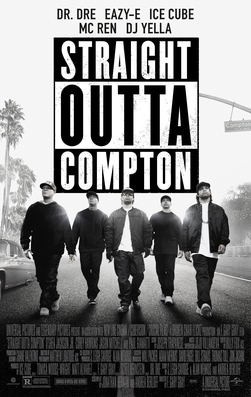 Another, I think fair, complaint is that Straight Outta Compton can be a bit of a whitewashing of N.W.A. itself. The group lived very indulgent lives on the road, and whatever misogyny they had both as individuals or within their lyrics the film won't ever touch. Straight Outta Compton may want to be a 'warts and all' portrayal of N.W.A., but to a certain degree, the film wasn't going to bite the hand that feeds it (since Cube, Dre, and Eazy's family all participated in the making, down to having Cube's son play his father). If one takes a look at the film, women played virtually no part in their lives except as things for pleasure (apart from Dre and Cube's mothers). Not having seen any of the Friday films, I had to have the "Bye, Felicia" bit explained...and I still don't quite get it. I put that up to my WASP upbringing. In terms of performances, however, Straight Outta Compton does an amazing job. O'Shea Jackson, Jr. bears such a striking resemblance to his father that it does genuinely appear that a younger Ice Cube is taking the stage. Putting aside the resemblance, Jackson, Jr. does an excellent job bringing the conflict of Cube with his other members and his struggles with Heller to life. We see how Cube grew into his hatred for the police (the only real gang around here, as he wryly observes). Is there an irony that the man who penned F*** the Police has now gained greater fame by playing policemen in comedies? Hawkins and Mitchell were also excellent as Dre and Eazy-E respectively, with Mitchell in particular making Eazy a figure who thought himself clever but who had fallen under the spell of Heller which almost nothing would take away from. Giamatti seems to have cornered the market on questionable, sleazy figures/managers (Cinderella Man being the exception, though there he was still a bit of the bundle of nerves Giamatti seems to play often), and the interplay between Giamatti and Mitchell made the film almost a tragedy in how blind Eazy was to Heller's duplicity. Even in smaller roles, Lakieth Lee Stanfield and Marcc Rose as Snoop Dogg and Tupac respectively looked and sounded so like their counterparts Straight Outta Compton could almost be a documentary. The credit goes to director F. Gary Gray and Jonathan Herman & Andrea Berloff's screenplay (with a story by S. Leigh Savidge, Alan Wenkus, and Berloff), sadly the only Oscar nomination the film received. Perhaps because we have so many figures to work with, and so many stories to follow, Straight Outta Compton can be a little unwieldy. After all, MC Ren and DJ Yella were virtually cameos in the film, so much attention paid to the triumvirate of Eazy/Cube/Dre. Still, despite these flaws, as a film and a chronicle of this influential group (for good or bad, depending on where you stand on gangsta rap), Straight Outta Compton is a great achievement and worth seeing regardless of what you think of the music.